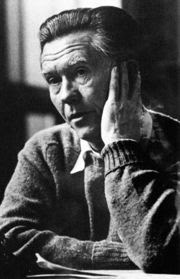 Behind the Lines: Poetry, War, & Peacemaking: Stephen Cramer's "The Ark" on Poetry Daily/William Stafford's "Peace Walk"
Stephen Cramer's "The Ark" on Poetry Daily/William Stafford's "Peace Walk"
Instead of kvetching about Poetry Daily, why not give them their props? They published a poem last month by Stephen Cramer, "The Ark," that was a plaintive and articulate rendering of a protest: "Let's face it: there's no inoculation,/no immunity for us/or those/we claim to help...."
William Stafford's "Peace Walk" delves into similar territory. Stafford, a conscientious objector during the Second World War, wrote a lifetime of deceptively simple poems fundamentally concerned with confronting the problem of violence and the breakdown of human community. Yet unlike many of Stafford’s less partisan poems, “Peace Walk” actively embodies the collective “we” as a group of war resisters on an “un-march,” marked as “other” by the gaze of the social orders. The poem offers two elements typically missing in poems about anti-war protest. First, the poem represents a specific kind of demonstration, a peace walk, one that defies the conventions of protest and collective action. Second, though the poem clearly situates its identification with the demonstrators, its overall sense of ambiguity and self-critique renders it an acutely Yeatsian “argument with ourselves,” thus working against the monological lyric. He self-effacingly points to the limits of demonstrators’ vision (both physical and metaphorical) and of the walk itself; “we held our poster up to shade our eyes” suggests both a desire to flee the protest and the judging gaze of the bystanders. Despite the fact that any ideological placard narrows a person’s perception, Stafford does not condemn the demonstration or demonstrators; in fact, the final lines contain in their lonely description of the protest’s dispersal a vision of egalitarian society. It would be easy to read the final couplet simply as the failure of the demonstration, of Stafford’s poetic skepticism of a public protest. Yet, the fact that “no one was there to tell us where to put the signs” forces the individual demonstrators and not some authority figure to decide what to do with the “signs”—not just the physical placards, but also the things that they signify: the dangers of nuclear testing, the resistance to warfare, a vision of human community based on love.